Ridership on Auckland’s trains has experienced fantastic growth over the last few years, increasingly a staggering 70% in just three years to 17.3 million trips as of the end of September. The positive thing is that the growth remains strong at nearly 20% per annum. Growth has been so impressive that it is ahead of what was projected to occur with electrification, despite the electric trains not coming into service around two years later than expected in the business case. The good news is the forecast for the future looks bright. The new bus network that’s just been rolled out in South Auckland and over the next 18 months will be rolled out to the rest of the urban area. That, combined with the recently implemented Simplified Fares will likely see a lot of people transferring to trains as part of their journey and should continue to help drive ridership over the next few years. No one knows just what the maximum capacity of the rail network will be prior to the City Rail Link but previous modelling has suggested somewhere in the 20-25 million range. But there are definitely some clouds on the horizon in the form of capacity constraints. Already we get reports of services at, or close to capacity during peak times and as patronage rises that will only get worse. How will trains cope with another 5 million+ trips a year on them? Ultimately we need more trains, both to increase the length of our existing trains so more run as six-car sets and to run more services. But there are two main issues with this. Even if Auckland Transport placed an order for more trains today, it will take at least two years before we see them on the tracks and carrying passengers. Based on current trends we don’t have that long. To run additional services it requires the completion of the City Rail Link (and other associated infrastructure like signalling improvements). That isn’t expected to be finished until 2022/23 and until that happens, peak frequencies can’t change from what they are now. Note: Because the CRL makes services more efficient, AT have said in the past they think they have enough trains to run services once the CRL opens. They’re absolutely kidding themselves if they think that’s true. So here are a couple of thoughts on what we can do to address this and ensure there is still enough capacity to enable ridership to grow. Our trains are so stupidly slow it feels George R.R. Martin writes books faster. The sad fact is that right now, the timetable with brand new electric trains is slower than it was with the clunky old diesels. Through a combination of archaic operating process and poor technology they are often both slow between stops, especially approaching stations, and have incredibly long dwell times at stations. My perception on some of this may be clouded by being on the Western Line which often has a level crossing right next to the station. We know that over the last year or two, numerous signalling, track and train improvements have been made to enable faster, more reliable services but so far those improvements haven’t been reflected in the timetable and sometimes feels like services are being kept slow just to avoid getting ahead of schedule. Run times on the Southern and Eastern Lines with electric trains will be shorter than previous pre-electronic train control system (ETCS) signalling with diesel trains, with equivalent times on the Western Line due to large number of rail level and pedestrian crossings and speed limits at these crossings. But nothing appears to be being done about the dwell times which can often exceeding 50 seconds even for minor stops. This was a video I shot while in Tokyo of one of the metro lines showing a dwell time of just 20 seconds from the time we stopped till we were underway again. Admittedly not all trains were this fast but this is what AT should be aiming for. One process used in Japan that we could fairly easily adopt is to have the train manager in the rear driving cab of train checking the doors/platform are clear rather than the process we have of the TM closing all but one door, checking they’re closed then closing his door before the train can leave. At stations on curves giving poor visibility, screens linked to CCTV cameras can assist TM and we already have this at a couple of stations, such as Fruitvale Rd station. Even a few seconds saved at each station can add up significantly. Saving time not only frees up more trains to boost capacity but also helps make trains more attractive in general. This one seems kind of obvious but given the two-year lead time for trains, it’s essential we order more as soon as possible. We know there’s already been talk within AT about the need for this and it also appears they’re also looking at tying it in with decisions around how to deal with Pukekohe. One solution talked about is buying up to about 10 battery powered trains to enable electric services to be extended without the high cost of extending the wires. That in turn would free up some units to allow more services to run as six-car trains. The key issue though is funding and who pays for it as these trains don’t come cheap. Each train costs something like $10 million to build so we’d probably need at least $100 million now and more after the CRL. Currently AT consider the peak to be 7am-9am and 4pm-6pm but even within those times there is a ‘peak of the peak’ and it is at those times where capacity is most constrained. AT should be looking at how they can encourage more people to travel at different times, both for addressing capacity constraints but also for attracting more people to use services. The first step will be to improve off peak services so they run at a minimum of every 15 minutes all day but AT’s own statutorily required Regional Public Transport Plan calls for even better with services at a minimum of every 10 minutes on the three major lines. We’re hoping the previously mentioned March timetable change will see improvement on this matter. Another important thing they could do to encourage off peak travel would be to implement off peak fares, offering a discount for travelling at times when the network isn’t as busy. Of course, not everyone can shift when travel but some can and the added benefit of this is it could attract more people to use PT. Of all the options at AT’s disposal, perhaps the fastest, cheapest and easiest might be to reconfigure the trains. Our trains are currently configured to focus on longer distance trips by squeezing as many seats in them as possible. Each three-car train has around 230 seats and of which just over 2/3rds are set to face forwards of backwards with the remaining, including the low floor section of the middle car, set up as metro style sideways seating. The trains are also said to carry 143 people standing although at a squeeze I’m sure they’ve carried more. There’s a good reason so many PT systems use sideways seating and that’s because it enables a lot more people to fit in each vehicle and while I was in Japan I noticed even most medium distance trains travelling further than Pukekohe were configured exclusively this way. It also doesn’t lose all that many seats because sideways seating takes up some of the space otherwise needed for leg room. As a comparison, the low floor section of the middle car has 16 seats on each side, although half of them can fold up to enable bikes, prams or wheelchairs to more easily fit in, while the centre section of the two end cars has 20 seats per side. I realise not everyone likes the sideways seats but I’m sure most would rather be able to get on a train them be so busy they’re forced to wait for the next one. We should probably consider doing this on some buses too, the red Citylink would be a prime candidate. With a 2 year lead time for more emus it may be time to look at bringing back several 6 to 8 car sets of SA/SD and sort out a few of the electric EF locos. A few months for refurb and sorting any issues with 25kv on the EFs. EF locos will never be able to run in Auckland without a complete rebuild. Do you have any info on why a rebuild is necessary? I searched for info on this but found nothing. They cannot run in Auckland because the fault current tolerances are different. To fix that would require a rebuild of the EF. AT the moment a fault current on the EF would weld the train to the rails. So just some reworking with modern electronics to deal with current fault detection and breaker/relay circuits. Not much of a rebuild…. Speeding up the dwell times has to be the low hanging fruit. At 50-60 seconds per stop, the dwell-times on AKL’s trains are much slower than good-practice dwell-times, which are closer to 25-35 seconds. Saving 25 seconds per stop over 15-20 stops from Pukekohe/Swanson to the city would save 5-10 minutes on every trip. Also useful to note that 5-10 minutes is almost equivalent to the (direct) time-savings delivered by the CRL. If we’re prepared to spend $2 billion on the CRL to save 10 minutes in running-times, why wouldn’t we also throw some dosh at the dwell-time issue? I appreciate the CRL is glorious, tunnel-digging, ribbon-cutting expenditure, while the other is inglorious, dirty, and unthankful OPEX. But it’s critically important, inglorious OPEX :). Outrageous that we spend a billion dollars on electrification and we can’t make the trains go any faster. Start with the unelected AT official that chose the cheap over the good train option. Followed by the muppet that came up with the half pie safety feature ETCS, either do it properly or don’t bother. nothing wrong with the trains as far as I know, or at least nothing that would prevent them from achieving faster dwell-times. CAF units in Spain seem to operate extremely well. Railways in Spain don’t even remotely resemble railways in Auckland. The bugs are still being ironed out of the CPU systems (things that CAF didn’t think of as they don’t occur in Spain) and now faults are being caused by wear and tear due to the adverse track conditions they have to deal with. So they should have brought trains that were designed to work with poor track rather than fixing the track? No Trundler they should have bought some hardier units as we know the tracks are not being fixed to a descent standard any time soon. P.s. What was the “good” train option you refer to? I would say one of the two manufacture’s that originally tendered (one was chosen then before the deal was signed AT put it back out to tender) that pulled out of the mickey mouse tender system the second time around. Ted, some facts are in order. See this link for a potted timeline as it stood in 2011. It wasn’t AT that did all this, it was Kiwirail, as it was asked by the National Government to (a) manage the tender process and (b) re-tender the whole thing at the hest of Joyce and Key, Which was suspected at the time due to the fact that no Chinese bidders were shortlisted in the original tender shortlist. So where do AT come in the picture? particular these un-elected AT officials who you say selected CAF? Given that the whole process was a KR stitch up from the get go? And who made the call for the half-arsed ETCS implementation? That would be KR and MoT between them not AT. BigTed. Please do some (basic) research before (confidently) spreading misinformation about train tenders. The historical record doesn’t align with your interpretation at all. What is “half-pie” about the safety improvements that have been made by the introduction of ETCS? ETCS fully mitigates the overspeed risks (i.e. the risk that caused the nasty overturn of a SA set at Westfield a few years ago), the Signal Passed At Danger risk at signals (look up Ladbroke Grove for example of what happens if you are not lucky after a SPAD) and mitigated the buffer stop collision risk (see Melling). It has allowed line speeds to be increased (for EMUs only) in some areas. Are you suggesting that they should have installed “proper metro signalling” like CBTC with a cost per KM many times that of ETCS and which has never been deployed on such a complex, mix-traffic railway? For those still unsure of the benefit of ETCS; the Croydon Tram accident https://www.theguardian.com/uk-news/2016/nov/09/croydon-tram-crash-kills-at-least-seven-and-injures-more-than-50 is believed to have been caused by ‘overspeed’ through a corner, something that ETCS – had it been fitted – would have prevented. I can’t stress too strongly that in a competently managed urban rail service an off-peak minor station dwell should be no more than 20-25 seconds, as is common in all Australian cities and, I’m sure, hundreds of other cities around the world. In Sydney, for example, this is typical: buffer 1; door opening 4, handling passengers 10-15, door closing 4, buffer 3, total 22-27. (‘buffer’ = the time between when the train stops and the door starts opening and vice versa). This is for 2-man crews and large plug doors. Sliding doors properly designed to minimise opening and closing time can save 4 seconds on that. If off-peak minor station dwells are 50 seconds, as commenters report, that simply shows high-level incompetence in procurement and management. I continue to be amazed that such an expensive, closely-planned, blank-slate project managed to get such poor outcomes on this important detail. Did no-one think of looking for world’s best practice and saying, ‘We want that’? Time for the authorities to stop being defensive and start doing something about it. Do they also have the retractable ramps that are by far the slowest part of the Auckland operation? No. I haven’t seen these ramps. Is it the case that they deploy automatically at every stop? If so, that’s ridiculous. It should be/should have been a ramp in a suitable position to be deployed by the driver if and when a wheel-chair user asks for it, as is the case in Melbourne. In Melbourne the driver gets out and manually places a ramp stowed near the cab, which is very slow and clunky – I’m suggesting it should be a mechanised version of that. They deploy whenever a door in the middle car ‘T unit’ is opened this section is basically but not exclusively for bicycles, wheelchairs/ mobility scooters and prams. See the picture above with the seat down the sides. The plug doors seal a lot better than sliders which reduces drafts, noise and A/C load. I believe they’re more typically aerodynamic too. Have you seen the new Thameslink trains for London? They have non-plug sliding doors and look like something designed in the 1980’s. Because then you save 10k in direct costs of vehicle ownership, plus cost of garage at home, plus you get to be productive for the 1 1/2 hours. Most people dont have their vehicle costs picked up by tax and ratepayers, and most dont have a chauffeur to do the driving for them. Except you need a car anyway if you like beaches, surfing, bush walks, trips away, visiting friends on weekends, going out past 10pm, getting to the airport, picking kids up from school if they are sick, mountain biking, transporting musical equipment, buying anything that is sort of big, don’t work in the CBD, want to coach your kids sport teams, want your kid to be able to have friends over/do things, want to be able to take you grandmother for lunch etc. Except you can use your households main car for all that. If you all drive to work, then you need to buy extra cars, one per person. Hopefully Mr Goff is now talking with AT management about this to get our trains moving faster. What is that dumb term people use? Oh yeah Induced Demand! why are you so fixated on the phrase “induced demand”? The key thing for me, as with any piece of jargon, is that people do actually understand what it means, rather than whether the term itself is precise. You asked so I will explain. If we say increase in quantity demanded we all understand that means supply increased but there was no change in the demand function. It is accurate and value neutral. If we say induced demand then we are implying a value judgement. My evidence of that is that everybody is quick to say induced demand for any road improvement as a way of dismissing the fact more people are travelling and gaining utility. But the same people then get pissed off if anyone is impolite enough to use the same term about PT or cycling. Induced demand in itself is clearly a neutral term. I think the reason it is used against roads with such scorn is that road funding so often ignores induced demand, whereas, induced demand is the entire point of PT in our current situation. See below. No. You have it backwards. The inducing bit is good, honest. It’s the idea of ‘demand’ existing in some objective universe outside of human action that’s bogus. I know that’s what taught at engineering school but its a nonsense, an attempt to glorify value decisions with scientific objectivity. Inducing use of cycleways and Rapid Transit systems is desirable by every real metric. Inducing the increased use of single occupant vehicles is a complete disaster, also on every single metric and at every scale; from local to global. So no one is ashamed of inducing bike and train use, you can’t tar all inducements with the same brush. The meeting of any demand is not the task, but building good infrastructure and it being used is a cause for celebration. Transportation planning and engineering is not a value free task. This ideas and this language are used to justify investing in the otherwise unsupportable. To reduce this idea to absurdity: There is a ‘latent demand’ for cholera, which we could meet (induce) by building a medieval water and sewage system; if all demands are equal and without qualitative value then shouldn’t we meet this one? Which is exactly the value judgement we should be wary of. It shouldn’t matter what mode people use. We should provide if the benefits exceed the costs. If that is rail then great, if it is by private vehicles then that is no worse, so long as we include the full costs. Value judgments are just bias. PT can give economies of scale that cars seldom do and that needs to be included but it is pathetic to dump on one mode as a matter of principle. People travel if it is worth their while to do so. We ought to have a system that puts a realistic price on that travel but which is mode neutral. Not some diktat that we will only have roads or just as bad the nonsense that roads are bad and any growth in traffic has no value, it does to those who traveled. Oh and in the interests of balance the growth in rail is fantastic, I only raised the issue of induced demand to show the bias people have to mode choice. You are delusional. What you call bias is grown up evaluation, you flatter yourself with fantasies of objectivity. Try honesty instead. All choices freight values. Your list of what maters contains value choices but you feign at godlike objectivity. That kind of thinking explains the mess we’re in. Patrick I never know whether I should argue with you. It’s like meeting someone who says they are Napoleon. The last thing you should do is try and discuss the battle of Austerlitz. When I do an assessment I use the objectively defined values for travel regardless of mode. When I have needed a mode choice model I have used the best I had available. Sometimes it has undercooked PT in hindsight but at the time it was the right way to do it. I certainly don’t make your assumption that all engineers are wrong and you are somehow right just because you know you are. If I sling off at PT here its not because I don’t value it. It is to prick the nonsense bubble of spruikers, dreamers, urban designers and assorted idiots who think they have all the answers but lack the wisdom to know they dont. The position embodied in the line above is the institutionalised problem I have an issue with, it’s nothing personal, I’m delighted you’re here, but that perfectly expresses the world view I am interested in unpacking and complicating. This idea of the inherent superiority of what is essentially a reductive view of the world as taught to and practiced by many engineers and planners is exactly at the core of what’s wrong with our cities. We should never have elevated this class of mechanics to strategy positions. It is to take a practice of problem solving that is effective lower down the scale and to elevate it beyond its utility. It is to use a kind of analytic thinking to address issues that require synthesis. This reductivism only works in closed systems, so when those that only have this tool are faced with the complexity of open systems they are tempted to just reduce what they see down to fixed variables and voilà; all is suddenly so certain, except of course it fails. I have met really talented transportation engineers, people who understand the limitations of the practice as it is usually performed, so I am sure the field is fixable [though the term; ‘traffic engineer’ will surely be outgrown], and none of them would speak with the small minded superiority of your line above. Patrick I am small minded, I accept the criticism. But I know enough to understand I don’t know all the answers. The one thing I suspect though is if you give up on numbers and forecasts just because current models are unreliable and just base everything on one person’s world view you end up quickly with the strongest willed person deciding everything. It might not be your view that gets enacted. For every urbanist or central planner, I have met another person who thinks too much money is spent on Auckland. Transportation planning is, at its core, an allocation exercise. Better that we figure out if our models are underspecified and fix them than throw them away. But the start point is land use and why people make the choices they make. That can’t be replaced with some daft assumption that in the future everything should focus on the CBD. Patrick, I could level the phrase “small-minded” at some of your comments. Engineers aren’t usually mechanics, but there is nothing wrong with being a mechanic, nor having a mechanic in a strategy position. My dad is a mechanic and he is highly intelligent, but he never had the opportunities I did. You use the word mechanic like it is a dirty word as if somehow the personal values of a mechanic don’t matter or are not equal to some enlightened professional. You will always get people who will disagree with you, but it doesn’t always make them wrong because their values are different and they see the world different to you. Anyone of any profession is capable of being small-minded, biased and prone to feelings of superiority. Ari I just take Patrick’s comments as a complement. It is an argument as old as western thought. The ancient Greeks thought there were three types of knowledge, scientific, technical and practical with the first being the highest level. They even thought it was beneath them to go and measure or observe things as just thinking stuff up was better. Hence they are called ancient Greeks. This status thing is why Shakespeare called his artisans the Rude Mechanicals in Midsummer Nights Dream. Some people still look down on Techne and think you can just believe a theory as some form of narrative. The rest of us bought into the scientific method. In my experience when people say “induced demand” they just mean the government did something that caused an increase in the quantity demanded in equilibrium. That’s fairly neutral, and fairly reasonable IMO. It doesn’t imply it was good, bad, or ugly. Just that it is was a consequence of an action. As others have noted, inducing demand in PT and walking/cycling is — normatively — a good thing insofar as it aligns with strategic government (central and local) objectives. But this normative judgment comes not from the term induced demand, but whether the outcome is something we want. I hope you are sharpening your caustic thoughts for the exercise in traffic congestion multiplication we are soon to experience with the Waterview opening….? Both phrases describe things adequately enough, but where both are misleading is in the second half; demand. Induced Congestion, would be better, including for the rail passengers above, that is ‘human congestion’. If we called it that we then think more about our priorities in further investment. Is this that kind of congestion we want more of or not? Outside of a failing economy and falling population we are going to get congestion; let’s select and shape that congestion better. And we should start right here with the language. Patrick my caustic thoughts about Waterview are already sharp enough. It is the most expensive piece of queue shifting this country has ever attempted. Aunty Helen’s parting gift to her electorate. I think that the Kirkbride Rd over-bridge near the airport must be about as bad for the $ per km the queue shifts. Last I heard it was $160 million to move the queue about 500 metres or so nearer the airport. Madness. At least Waterview moves the queue 2 or 3 km down the road. Yeah, I’m not quite sure what your problem is with ‘Induced demand’. For me it is a simply shorthand for “provide more of something and people use it more”. Induced demand on PT is great, it sets up a virtuous cycle of increased usage, increased efficiency and, hopefully, increased service levels. We have a long way to go before hitting the peak of the U. On the roads however the virtue stops pretty early. Increased use might be good up to a point if it means getting, say, a road paved or a signal for your right turn… but almost all of Auckland is well beyond that into the vicious cycle of more traffic, wider roads, slower intersections, less efficiency on maintenance and renewals and trying to shoehorn half billion dollar one-lane widening into the Northwestern. Apologies Nick I was being inaccurate. When I said “what is that dumb term people use” I should really have said “What is that term dumb people use”. Elasticity of demand with respect to price/quality/convenience is a fundamental, well-proven theorem of economics. ‘Induced demand’ is well-established transport planners’ terminology for this phenomenon in the field of transport. If you make it cheaper/easier for people to do X, people will tend to do X more often. That increment of X is called ‘induced demand’ – that is, ‘induced’ by whatever you did to make it cheaper or easier. It’s a pretty clear expression and it contains no value judgment. Whether you think it’s good or bad, depending on what X is, is a different question. Incredible that you didn’t mention the 104 modern carriages built for $200m between 2004 and 2011 that AT have sitting in storage. All the capacity they need, in excellent condition, paid for, and ready to go right now. There’s no reason at all why they can’t be put back into service within weeks, enabling the EMU’s to all be doubled up. There are no level crossings with speed restrictions by the way. Only the EMU’s approach them slowly – all other trains fly through at maximum speed. The issue also isn’t with ETCS – it’s with the silly set of rules that they came up with for programing the technology. Weren’t the diesel fleet breaking down lots though? Mind you there are plenty of ‘train faults’ or ‘track faults’ that occur currently. The diesel fleet could be used to increase the off-peak services. I live near a train track and do like the quiet-ness of the EMU’s haha! So not really too keen on the diesel fleet being used early mornings. March 17 will bring you station skipping on the southern and Onehunga lines, giving a trip to Britomart from Onehunga and a worse counter peak service on the southern line with only two minutes cut out of the full trip that is mainly by not following an Onehunga service so closely. station skipping sounds like a poor way to resolve issues with slow and/or too few trains. Stu I didn’t say it was a good idea (personally I think it is a terrible idea) but that is the plan from At that I’ve heard is happening in March. Onehunga peak services will not stop at Greenlane or Remuera in either direction and the southern trains counter peak will skip stops then continue all stops with the following train do all stops then at the point the one ahead started all stops it will start skipping. It frees up two 3EMU sets for the peak but doesn’t provide a better service if you are a traveler that doesn’t go in peak direction. Sailor Boy I could not agree more but AT have the opinion that there is still plenty more capacity in the current trains that needs to be unlocked before more trains are ordered. Something to note when the last of the current 57 units were coming of the production line CAF offered 20 more at half price, AT declined. I personally would have supported slightly higher rates to cover borrowing and/or the sale of POA and/or airport shares to fund these if the government had turned them down. This doesn’t sound like an all bad idea to me. What’s so bad with Onehunga services skipping Green Lane and Remuera if it saves needing to buy another $10m asset? 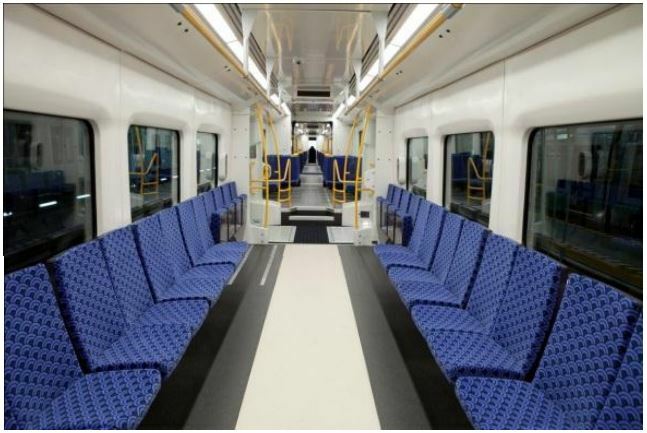 For the few from Onehunga who need to go to those stations, there will be a Southern line service close behind which they can transfer onto at Ellerslie onto (remember the mantra of this blog is that single seat journeys are not to be prioritised! :-)) and for the majority of passengers from Onehunga, who are going the longer distance their journey time will be improved by 2 x 50s dwells, plus acceleration/deceleration times every day!. Also it will mean there are trains whizzing up alongside the cars parked on the Southern Motorway, looking like they are really shifting rather than just either accelerating or decelerating as they are currently, which should act as a great (free) advert to those in the cars to consider the alternative. Agreed. We should have bought enough trains to operate 6 6 car tph on all lines straight off of the bat. 2 Mins???? seriously … that is crazy. Onehunga is also the latest one to be rumored as the only trains stopping at Parnell so it is only effectively cutting out one stop but it still frees up one set during peak. Given your complete rubbish regarding CAF tenders above it’s hard to take you seriously. Sounds gnarly. Why not have all southern line trains skip Greenlane and Remuera (and Parnell) in both directions, consistently? That would be legible and benefit a lot more people… I guess the problem is not having frequent service on the Onehunga line to pick up the slack. If you want to see it on AT planning papers ask Patrick if he can put up page 5 (2017 Timetable Skip-stop counterpeak) of the ‘CRL – Operations update’ document I sent him a few months ago. While this does still show the southern trains stopping at Parnell and doesn’t show Onehunga peak station skipping, the word around the water cooler is Onehunga will skip Greenlane and Remuera but stop at Parnell, the southern trains will not stop at Parnell but will otherwise operate as per the document. BigTed – read my comment carefully. I didn’t suggest it was your idea. At all. Stu I didn’t mean to imply you did, I was just also pointing out that is was not a good idea adding my personal opinion in the brackets. If true this is crazy: it’s service planning all about moving boxes without any idea about the entire purpose of the service: THE CUSTOMER!? I rarely revert to all caps, but this is bonkers, service legibility and predictability are extremely important. 2 minutes and more can surely be found, and should be, in the flabby dwells, dribbly acceleration, and padded timetable. Yes it’s a constrained network, but this is a white flag, not a solution. Skipping stations is common practice, including in Wellington. IIRC Waikanae trains skip all stations south of Porirua? A good system for Auckland would be to have Papakura trains make all stops Papakura-Otahuhu, then express to Britomart (with one stop at Newmarket), and Otahuhu trains that make all stops Otahuhu-Britomart. People can transfer at Otahuhu. Just need to make sure the expresses leave Otahuhu eight minutes after the all stops, so they get a good clear run to Newmarket. All trains would arrive more or less evenly at Britomart. That would be a terrible system Geoff. We would half the capacity of the Southern line, and half the level of service. AT are losing the plot. Sort your dwell times out before messing about with station skipping. If this one happens it will be time for complaints to Phil Goff. Those would be the same carriages actually built 40 to 50 years ago, abandoned by British rail in 1996, picked up by a museum operator and put into storage for a decade, then un-mothballed and given a refit ten years ago that was intended to stretch them for ten years? Yes, and most were in excellent condition when replaced by the emus about 18 months ago. Certainly not showing their age as the bodies were well refurbised and they were on modern KR bogies. There would be many years life left in them. It just seems such a waste having this resource in storage when the need for more capacity is almost upon us. I dont think its possible to insert an SD or two between emu sets: emu-SD-SD-emu so loco hauling them is probably necessary. And since those DC and DF diesels are now not available and AT doesnt want them anyway, the only option would be the EF electric locos that KR is struggling to find a use for. These are certainly not worn out or eol with several having been in long term storage as excess to requirements. Any technical issues should be minor as these are 25kv 50hz ac same as the emus and they can haul passenger carriages as proven when used on KRs northerner trains. Also the etcs was on the DCs so that equipment could be transferred to EFs. Maybe an issue with using an SD since this has a diesel genny in it to provide power to SDs (doors/lighting etc), would be good to have EF provide power for SDs and perhaps run around train to be always pulling. “emu-SD-SD-emu” Dear lord what an abomination. Kill that though with fire and bury it at a crossroads under a new moon. Mike (tlo), These BR Mk2s were selected for being in the optimum condition, refurbised/refitted. They looked good, were passenger friendly, safe, reliable and run smoothly. As expected with the several $100M spent on them. The EF locos are not slow acceleration old freight locomotives. They will out accelerate any diesel in NZ and could probably match emu performance. Even if there is some sort of performance limiter/inhibitor this will likely be adjustable/removable. At 3000kW I suspect they could move 7 or 8 SAs at a respectable acceleration and speed. Why would an EF take up platform space? In the context of this blog post this EF/SD could be a cost effective solution implemented in months while AT get around to ordering more EMUs then the 2 to 3 year wait on them being available for service. Dgd: some points in response. f) the Wellington experience of running locos designed for heavy freight (EOs in their case) on multiple-stop suburban passenger trains would make most operators think twice. So only solution would be to use an SD and ensure SD end of train always enters Britomart. No EF running around train needed. Only about half of the SA/SD fleet have new S-Ride bogies fitted, the rest of the fleet have bogies from the 70s that have been re-used from the old 56-foot cars. I doubt a commuter gives a rats arse what boggies are under a carriage. Do you really think a commuter is going to turn their nose up and wait 10 mins for the next train (and hope that it’s not full). No Nick, it wouldn’t. As you well know, the carriages were fully stripped to the frame with everything discarded, then reassembled with all new components. Every part of the carriages you see inside and out is new. Only the steel frame was reused, which makes no difference to their performance from that of a brand new carriage. They are officially considered remanufactured carriages, which means “made new again”, as opposed to refurbished or overhauled. They were built with a 20 year life, the newest of which were retired with 16 years left. Point is, we paid $700m for 275 new carriages from 2004 to 2015, and are currently using 171 of them, with 104 in storage. We have ample spare capacity, so lack of capacity is not an issue. AT are going to be publicly reminded of this, and the significant price ratepayers paid, if they allow patronage constraints to occur without using that available capacity. An NZ version of the British Rail Class 88 electro-diesel locomotive. Just right to pull those SDs. From Vossloh Espana. Points of clarification regarding Japan EMU dwell times – the vast majority of train doors are cavity sliders which reduces any dwell time by 6 seconds overall. Average dwell time in Japan is between 20 and 40 seconds depending on the line, time of day/passenger loading. Often during peak periods, dwell time at some stations can be 50 seconds and above when 1,000+ passengers board/alight a 10-15-car train. Yep, I would fully understand Auckland current dwell times if we had 1000+ passengers boarding or alighting. A 45-50 second dwell time at Te Mahia when 5 passengers are hoping on the train … Not good at all. I can’t believe this stuff hasnt already been done or at least tried. What are these people being paid for? Why do amateur bloggers have to do their work for them? The management who operates the train gets fired if they increase safety risk. They also get KPI on reliability and on time. However they dont get paid more if they increase the speed and efficiency. So where is the incentive? They are best to play defensive and slow the train so that it will be risk free and has a super conservative timetable to increase reliability and ontime. Therefore the real fix is there needs to be some real KPI changes about operation efficiency and speed. Exactly. And there already is, certainly for frequency, which requires efficiency: the RLTP. Why do they ignore that? They don’t take such things into account because the RLTP is not a contractual document, and changing contracts costs money (lots of it!) with no guarantee of a successful outcome. To my mind, better to spend money on actual improvements rather than on lawyers etc. It’s a statutory document though. AT are bound to deliver on it. Agreed, but there are no organisational penalties for non performance; and Transdev is dependent on the infrastructure and equipment, all supplied by AT and its contractors, being up to the job. I assume if/when new CAF EMUs are ordered that they will be proper 6 or 7 or 8 cars in a set with continuous corridor the length of the set? It would be nice but I can’t see it happening. 7 or 8 car sets will only fit on 2 or 3 platforms over the network. If they are permanantly coupled to run as 6 car sets why not rip the centre cabs out and put extra seating in its place. No units are permanently coupled, even the few units that have restrictions (that must run as 6 cars) are not always coupled to the same partners. If the trains could do Britomart to Newmarket in 5 minutes, then we could have a lot of bus services which go through Newmarket to Britomart terminate in Newmarket. That would free up Khyber Pass Road and Symonds Street. Then, when buses are gone from Symonds St, we can start thinking about light rail! With the New Network in the South, I have noticed significantly less buses on Symonds Street. This means that I no longer see 10 buses competing for the bus stop outside Starbucks, and there is much less ‘bus bunching’ of the 274 and 277 bus routes. It’s a great idea until you remember that that is a key distribution route for the CBD. Ie getting off at Newmarket you need a bus to get to UoA. Yep, in the light rail post a few days ago, I think I read that light rail might be added to Manukau Road. Since Broadway/Khyber pass is an extension of that, why not add light rail to those too, and then you could get off the bus at Newmarket and catch a light rail to UoA? Yes, In 30 years time when Manukau Road is finished we can look at that idea. Perhaps I have confirmation bias – but I have certainly noticed that there has been a drop in the number of Symonds Street Buses. I don’t like seeing so many buses in the Central City. It looks ‘messy’ and it kind of terrifies me seeing all these buses zoom up and down the street. Light Rail down Symonds Street would make our city look very ‘grown up’ and much tidier. Right now the plethora of buses on Symonds Street from 3-6pm reminds me of some.. polluted Asian cities. Minor thing: I like the mention of 20 mins on the Onehunga line on Weekend days shown in the snipet from the Regional Public Transport Plan. Think station skipping sounds fine in some ways for operational efficiency & people going a long way but horrible for legibility. Surely not just the Onehunga line stopping at Parnell (well if only 2TPH especially)?! Sure hope this 2017 timetable improvement is not a disappointment. Think our Auckland system doing a 30s dwell time would be fine for now & surely achievable. I suspect AT are mainly going to rely on those other measures like seat arrangements, wider peak times & discounted fares to cope. I think some of the quick fixes suggested here are obvious: sideways seating only and shorter dwell times. Anyone who’s travelled on the subway/tube systems overseas knows it works. Commuters soon learn to get off and on the train quickly if the doors aren’t open long, and I don’t recall anyone not getting on the train because the doors closed too soon. Obviously it must happen in peaks, but even in Tokyo with their huge population everyone seemed to manage. Why we only run 3 carriages is beyond me, but doesn’t surprise me. We are a nation that designed the Auckland Harbour Bridge as a 4 lane ‘good-enough-it’s-what-we-can-afford-right-now’ piece of infrastructure, and we’ve seen that repeated a million times since, include the Britomart train station. Even the CRL extension (a repeat of the AHB ‘clip-ons’) sees us skipping the Newton station, and skipping the second Beresford St station entrance. Ok harbour bridge: as a proportion of regional GDP the original bridge plan was the equivalent of about a seven billion dollar project today, they scaled it back to about four billion. Recall how small and nascent Auckland was in the 1950s. Massive, economy crippling project if they got it wrong. In the end, it actually cost less to build the clip ons ten years later than it would have to borrow the extra money up front to build the six lane bridge… so actually we ended up with an eight lane bridge for cheaper than the six lane bridge by staging in the capacity and expenditure. I think we should bring back the old DMUs and convert them to electric. this would be cheaper than buying new EMUs. why didn’t we order 6 car sets instead of coupling 2 3 car sets together? if our platforms can handle 2 3 car sets, they can handle a 6 car set!!!!!! oh yes. I would be fine with 3 car sets if we had more so every train is 2 3 car sets. we only ordered 57 EMUs while wellington ordered like eighty!!!! Fact is the DMU’s, the SA’s and even the SX all had doors that opened the moment the TM pushed the button. And closed just as quick. Less than 20 seconds on a quiet run. These infuriating EMUs have the most retarded door system ever and made all the worse because they are plug doors rather than sliding doors and feature the ultra slow trailer car ramps. All to get rid of TM’S. Sure its safer but so is not getting out of bed in the morning. The car lobby make quite a play about 800 new cars being added to Auckland roads each week implying the need for more roads. 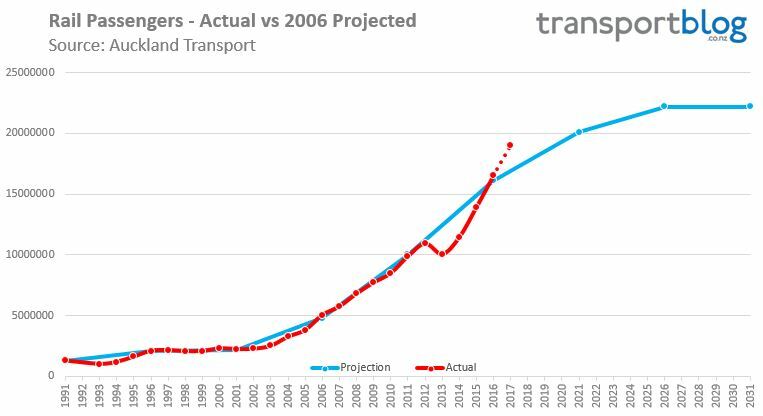 But each week Auckland Transport takes about 4000 cars off the road and so we need more buses and trains. AT shows 2million extra trips per year. A commuter takes say 10 trips per week. I have not ridden a train since last year, but is it still quicker to walk from Britomart to Vector Arena than the train is travelling? Well there isn’t a station at the Vector arena, so it is always going to be quicker to walk, but if you are talking about racing the train from point A to point B, then unless you can walk at a mix of 25 then 40 then 30km/h, you won’t beat the train! As much as 40kph -outstanding!!!!! I’m wondering why there hasn’t been any effort made to curb the substantial vandalism on our new trains and stations? Security cameras everywhere but little in the way of apprehension and prosecution of offenders that I’m aware of. In the interests of avoiding conflict nothing is done, there is always more ratepayers money available to fix it. @ Vance: That would be because they have decided to stick with the make jobs scheme of keeping a TM onboard. TM doesn’t do anything to kerb anti-social behaviour such as vandalism, fare evasion or violence. We need a transit police force. Gating more stations would also help since people who break the law in one way are more likely to break the law in another statistically. The instructions to TMs is to run the train on time and don’t get into conflict. Ratepayers have plenty of money so don’t worry about it. Times on the time tables in town for the evening runs give the times for the MORNING runs from somewhere around Papakura. I’m really starting to think it’s deliberate sabotage rather than incompetence. 1. Induced demand is a misnomer. The demand is there. Or it isn’t. 2. Skip stops ruins track capacity. To increase that you need a regular stopping pattern. Beyond that the answer is to build more track. I understand the following is confirmed for the new train timetable. – Every second train will run All Stops Britomart-Otahuhu, then Express Otahuhu-Papakura. – Every other train will run Express Newmarket-Otahuhu, then All Stops Otahuhu-Papakura. – All trains to run Express Newmarket-Ellerslie. Are you serious or having us on or putting the idea out there? If just on peak times perhaps quite a good idea, would really get things moving. Don’t think the Onehunga express would work on a 1/2 hour frequency or be worth it for the sake of two stops. Should add, Onehunga trains also won’t stop at Parnell. So technically you could say Onehunga trains will run Express from Britomart to Ellerslie, with one stop at Newmarket. I agree with express running, as Auckland really dropped the ball when it went to a system of all stops for all trains. It really slowed things down (a decade ago you could do Papakura-Britomart is half an hour on the railcars), and most other cities have them, including Wellington. But the alternating nature is going to take some getting used to by the travelling public. You’ll need to think carefully about whether or not you are boarding the correct train for your intended destination, and that will be especially important for users planning a transfer. Papakura-Manukau will be difficult if your train doesn’t stop at Puhinui! Funny that you’ve added this to a post titled ‘increasing capacity’ as a better scheme to kill off rail ridership use would be hard to devise. Perhaps that’s the plan; kill-off ridership growth so there’s always plenty of capacity…. lol. Incredibly stupid plan, and one that shows that the Rail Ops people still have no idea about the customer, the passenger. Most passengers are not trainspotters, and have absolutely no interest in understanding, let alone memorising, complicated running patterns; they just want to turn up at a station, not wait too long and get on a train. They do not want to turn up to watch a perfectly good train pass them by in the direction they are heading, and they do not want their train to fail to stop at the station they want to get off at. They do not want, in short, frequency to be reduced across the network. It is not clear from this rumour whether this is peak only. Which would be bad enough, but if off peak too [why would you do this?] then frequencies would go from poor to absolutely laughable at many stations. What is gained? Small speed improvements for those that actually can time a train to their destination. But so many will have increased wait times before departure as frequency is halved. Entirely defeating the purpose. Oh and just how slow with these ‘expresses’ run through the stations they are skipping, 10kph? They might as well stop. FFS, fix the dwell times, get the flab out of the timetable, and run a frequent and legible turn-up-and-go pattern. As instructed in the RPTP. This would improve journey times for every passenger and free up trains for increased efficiency and capacity.